Harrington's of Vermont is a brand of Harrington's of Vermont, Inc., based out of Richmond, VT. The brand has been around since 1873, known mostly for its hams and smoked meats. They also offer cheeses, syrups, and desserts. 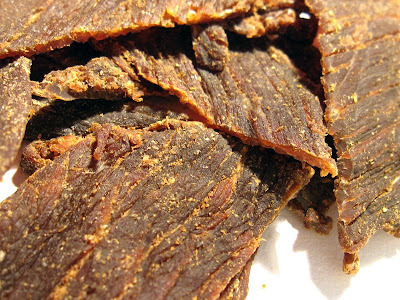 But they also offer jerky, two kinds in fact, this Original variety and a Maple variety. I'll be reviewing the Maple later. From what I can tell, it appears this jerky actually manufactured by Rosie's Vermont Beef Jerky. I've never had Rosie's, so I can't say if this actually tastes the same. And I didn't contact Harrington's or Rosie's to ask. Beef, soy sauce, worcestershire sauce, flavorings, seasoned salt, spice. The first thing I taste from the surface of these pieces is a worcestershire flavor, followed quickly by a good deal of saltiness. With more sucking, I can taste the soy sauce coming in. Overall, a lot of surface flavor intensity. The chewing flavor starts with more definition from the worcestershire, and a continuation of the saltiness and soy sauce. It seems like there's an increased garlic flavor. The flavor component that seems to dominate this jerky is the worcestershire sauce. Even though the soy sauce is listed higher up in the ingredients list, it seems like the worcestershire is tasted more than anything else. The soy sauce is noticeable, but doesn't stick itself out there. It's largely just coloring the worcestershire sauce flavor, and adding more saltiness. I don't really taste any natural meat flavors. The level of saltiness seems moderate on each individual piece, but it gets high after eating several pieces. And in fact after several pieces, the saltiness get strong enough to where that's now the dominant flavor. There's also a noticeable garlic flavor, but I think it's largely a component of the worcestershire sauce. I'll note that the "seasoning salt" listed in the ingredients also contains some garlic. Overall, what you're going to get out of this jerky is a strong worcestershire sauce flavor, with a good deal of saltiness. That saltiness will increase after eating several pieces to where that's the dominant flavor. You'll notice a bit of soy sauce, and a light garlic. 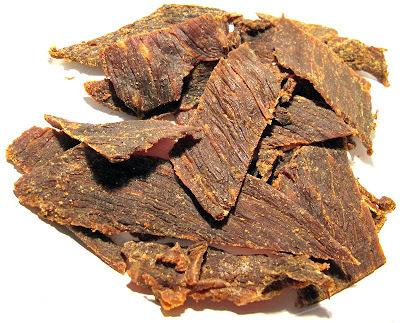 This is a dry jerky, with a semi-moist surface feel. These pieces are quite flexible with a soft feel. Tearing pieces apart with my fingers with the grain is quite easy, while chewing is somewhat chewy, and a little labored. The chewing texture starts out feeling soft, but with a fair amount of rubbery chewing resistance. After several chews, it starts to break down, and then several more chews it gets to a soft mass. At that point, it has a very steak-like chewing texture, but more like a well-done cooked steak, feeling a little dry. Much of this jerky appears to be free of fat, though I found one piece with some small bits of fat. I don't see any streaks of tendon or gristle, however, just about every piece resulted in some wads of unchewable tissue left behind in my mouth. For the most part, it's clean eating with no residue stuck to my fingertips, however I do see some small bits of meat on my lap. 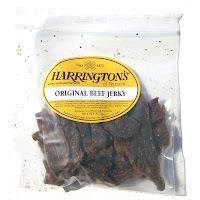 Harrington's of Vermont sells this Original variety of beef jerky from its website at a price of $29.95 for 15oz (four bags of 3.75oz each). Add to that shipping costs of $13.99, and the total comes to $43.94. That works out to a price of $2.93 per ounce. For general jerky snacking purposes, at the $2.93 per ounce price, this seems to provide a poor value. I'm getting a low level of snackability due to its high saltiness, simple flavor (mostly worcestershire sauce), and it's labored chewing. The $2.93 price per ounce is far higher than the mass-market jerky brands found in the grocery store, and I think those brands will get you better snackability. This Original variety of beef jerky from Harrington's of Vermont has a simple flavor, largely marked by a worcestershire sauce flavor. But it also has a high saltiness which after eating several pieces, seems to take over as the dominant flavor. You'll notice some soy sauce and garlic, but you won't taste any natural meat flavor. The meat consistency is ok, in that it's mostly all meat, easy to tear apart, and chews like real meat. But the chewing ends up somewhat tough, and in most all pieces I ended up with unchewable wads of tissue in my mouth. Overall, I found myself not being able to generate interest in this jerky, and therefore could not find much snackability. Perhaps a good beer pairing for this is a lightly flavored cream ale. Harrington's is the same as Rosie's.